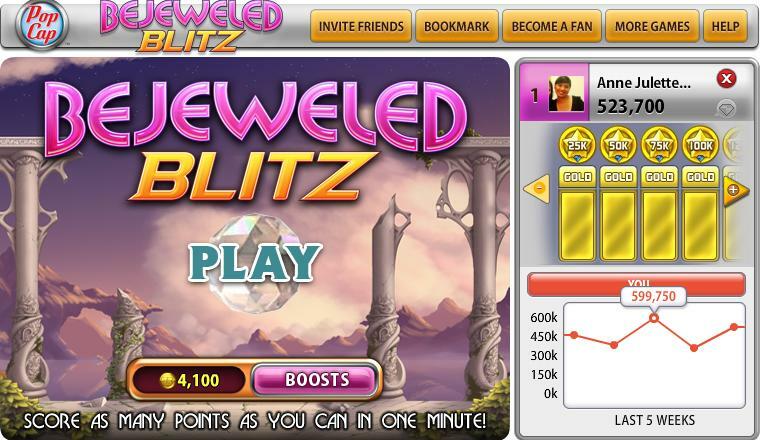 Bejeweled Blitz is one of the games in Facebook that has sustained its popularity since it has been introduced to the site last year by PopCap. It is a fast paced puzzle game, a round lasts only 1 minute, and the goal is to out-score your friends every week because the scores are reset every Wednesday early morning. Here are some tips on how you can out-rank your friends every week and be the talk of the town for your high scores in this game. Our goal is to get 300,000+++ every week for a safe spot on top. First, you should know how to recognize a good set from the first 5 seconds of the game. If you find yourself struggling to find a match, then chances are, it’s not going to give you good results in the end. Quit it and start a new game. If you start a game and quickly find matches easily, then that’s a good round. Halfway through the game, if you haven’t got any multiplier or you’re still at less than 50 thousand points, then it’s best if you quit the game and start again. It’s important not to waste time on games that won’t put you on the leader board. This is a so-so game. You can find 3 matches in a glance so you can play this set but I've seen better combination so you can quit this and start a new one too. This one's a good game. 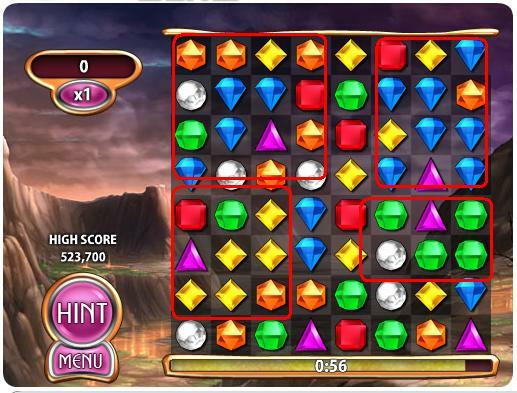 You have possibilities for big scoring and multiple jewel matches. You can play this game. This is a great game! Do I need to explain why? Just a few clicks and you'll have bonus items! Speed is the key to this game and as soon as the game starts, you should have already found at least a couple of possible matches in the board. And every time you successfully find some jewels to match, as your hand is leading the mouse to make the match, your eyes should already be looking for another one. Think a step or 2 steps ahead of the game. If you do this, you’ll start piling up Speed Bonus. Speed Bonus gives additional points to every quick matches you make hereafter. Speed bonus starts at 200 and increases to 1,000 points as long as you keep matching colors or jewels quickly. You should not break the momentum or else you’ll lose the speed bonus and have to build it up again starting 200 points. That’s a waste of a lot of points and time. Also, once you max out the speed bonus, as long as you keep getting matches really fast, you’ll notice that the bonus (upper left corner of the game) is filling up with orange color. Once it’s full, you’re going to have a few seconds of speed bonus explosion. All the jewels that you create matches with will explode and break the other jewels around it, which is good because it means more points for every match. Learn to prioritize matches that contain 4 or more jewels instead of just 3 jewels. Simple reason behind this is that they give you more points and give you bonus items. It’s important that if you see bonus items such “multiplier”, “flame gem”, “star gem” and “hypercube”, you should prioritize finding matches or using them, especially the multiplier. If you can break the multiplier as soon as you see it, then it will start multiplying the points that you get for every match from the moment you break it. Imagine if you have 1,000 speed bonus and you currently are at 7x (after matching a 7x multiplier gem), that 1,000 speed bonus gives you 7,000 points. 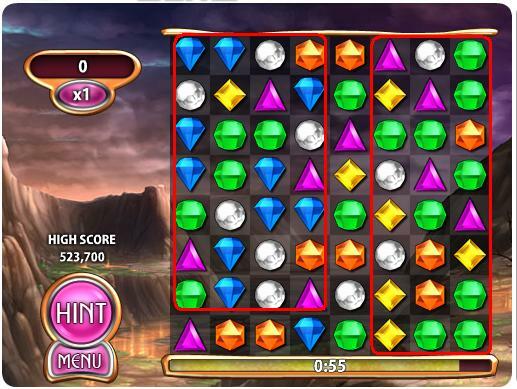 Start finding matches at the bottom of the board so that it shakes up the placement of the gems and gives you a lot more chance to find good set or balance of colors and matches. If you have enough coins to buy boosts, make sure you can buy the maximum number of boosts which is 3. Buying just 2 or 1 won’t do much good. Here are my top 3 boosts that work absolutely great when used together; Mystery Gem (and pray it gives you a hypercube or a multiplier), +5 seconds (adding 5 seconds at the end of the game is crucial because this is when you have a big multiplier and you’re piling up speed bonuses at this point) and Free Multiplier. Using boosts will give you easy 300,000+ points or as much as 500,000++ points. All in all, practice makes perfect and as soon as you get the hang of applying all the tips in this article, then you’ll find yourself placing first every week with the least amount of time spent on the game. 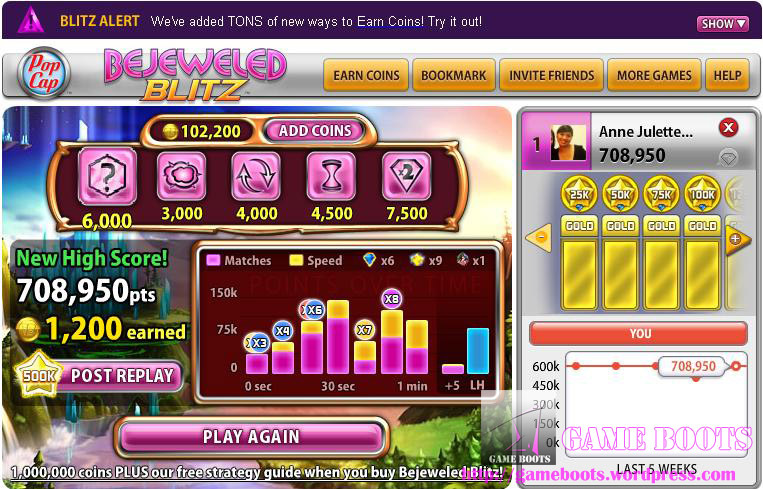 UPDATE as of August 21, 2010, here’s my last 5 weeks score, highest so far is 708,950! UPDATE as of November 17, 2010, my highest score so far 868,050! Can I get a Million next time? 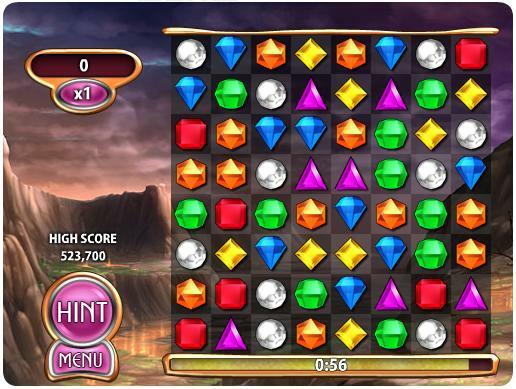 This entry was posted in Puzzle, Reviews, Tips and tagged bejeweled, bejeweled blitz, facebook, free games, game, high score, online, play, points, tip, tips, top score. Bookmark the permalink. 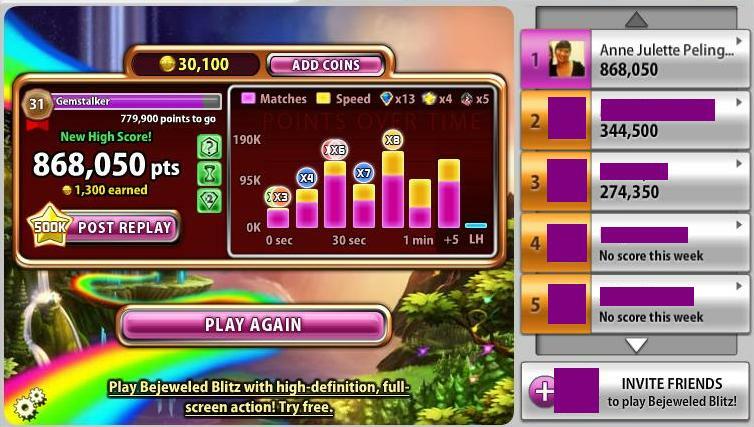 I scored my highest score since I have been playing Bejeweled Blitz on Facebook. I Love this game I play it every night for hours. My score last night was 749,300. I was so happy. Thanks. I think that when people get high scores on this game they should get something…Thanks. Congratulations on your high score! I know exactly how it feels after scoring so high after that 1-minute game! You’re like,,, “what!? that’s my score?! Wow!”… Because you don’t really pay that much attention on what your score is as the game is progressing or don’t really look at the time… You’re just focused on matching gems. Then at the end of the game and you get that kind of score, it’s just really exciting! Do you lose your boosts if you start a game and quit to start a new game because the board is not a good one to play? Yes, you lose your boosts if you decide to quit the game. For a while back they had a glitch where if you quit the game a couple or so seconds after it starts, you still get to keep the boost, but it seems that they’ve fixed that already. So even if you know your board and that round doesn’t look good, it’s still best if you continue the game until the end and rack up coins. So at least, you can still earn some more coins to buy the next set of boost if needed.